Kevin: [on the phone] I felt like I had a lot of time. Em: I know. It's good. I'm good. Kevin: Yeah. We're, um... we're just getting off the freeway. Kevin: Yes, he was coming in from Oakland. He was late, of course. Then I took him... And then, he took me to some lawyer bar. Kevin: Yeah. A lawyer bar, kind of. Yeah. I don't know. Everybody there seemed like a lawyer. I felt like I was the only person without a tie. Q: Why does the film have sudden cuts to black? Q: What's up with Beth's Vial? Q: What is the Schrodinger's Cat? What does it deal with the plot? I generally like the science fiction films which are lacking of visual excesses, well produced, and specially, based on the exploration of interesting ideas, which don't betray (too much) the "scientific" part of science fiction. 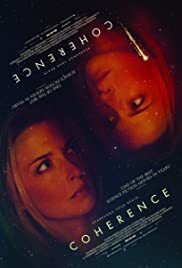 Coherence fits into that description, but it didn't leave me completely satisfied; its development is generally credible, but it occasionally makes too much of an effort to create conflict, when a more subtle and rational focus would have exploited its interesting premise better. Everything starts with the passage of the Williams Comet on a very short distance to the Earth... so short that its movement is clearly perceptible. So, its cosmic influence (or whatever it is) provokes a series of phenomenons which affects a group of friends during a pleasant reunion. Obviously, during the development of the night, the tension is incremented and secrets of the past come to light, something which complicates the bizarre circumstances they are suddenly facing. Those secrets and revelations are what I liked the least from the screenplay... the main event is interesting, and I don't think it was necessary to exaggerate the drama with fights lacking of any sense and childish attitudes from characters who seemed sensible some minutes before. Sure, it could be taken as a commentary of the frailty of civilized society, always ready to disappear in front of the slightest alteration of the "status quo", waking the aggression and low instincts from people who considered themselves above those reactions. But I couldn't swallow it. The fights and discussions feel like simple filler which inflates the film and obstructs the analysis of the situation. Fortunately, that is reduced during the last third of the film, letting the characters expose their theories and elaborate possible plans of action, while we witness the gradual dissolution of the reality around them. The actors make a good work in their roles and create a natural dynamic with each other which convinces us of the long friendship and occasional differences between their characters. In conclusion, despite some kinda boring and irritating moments, I can give a moderate recommendation to Coherence, mainly because of the interesting mystery it presents. 58 of 93 people found this review helpful. Was this review helpful to you?